Hot tubs relax muscles, they can be used before and or after exercise. The massaging action is provided by the circulation of warm water and air bubbles through the numerous jets. Floating in warm water stimulates the release of endorphins, these are the body's natural painkillers. As little as 20 minutes in a warm spa can help to relax tense muscles and relieve the anxiety and stress of a hard day. The heat of the water makes the blood vessels dilate resulting in an increase in blood circulation. As the vessels begin to expand your blood is able to flow far more freely, reducing the strain on your heart. The water provides buoyancy, supporting the body's weight by nearly ninety percent, this can help to relieve the pressure on aching muscles and joints. It can also improve mobility and helps to relieve some of the symptoms of arthritis and rheumatism. Hot tubs are fun! And that can only be good for you. To relax & release the stress of the day & gain the maximum effect of hot tubs the Zspas & Zen Spa collections are created with a range of powerful yet stylish jets which are strategically positioned to guarantee precise massaging of specific zones of your body. The Zspas & Zen Spas hot tub collection has jets placed in a range of specific areas to give the best hydrotherapy. Of course, it is pointless in having quality jets if there is insufficient power to provide the jets with hydrotherapy. Our hot tubs have a ratio of Jets / HP of under 10, for example the Emperor hot tub has 81 jets & 3 x 3HP pumps ( = 9 HP) so 81/9 = Jets / HP ratio of 9. This concept of quality provides a powerful relaxing massage experience & the below health beneficial virtues. Trials in the British Journal of Rheumatology (1994) show a positive short-term and long-term overall effectiveness of hot tub therapy in treating chronic lower back pain, participators in the study who took advantage of hot tub treatments experienced increased back flexibility, reduced pain duration than the group that did not undergo hot tub treatment. A trial in the New England Journal of Medicine (1999) wherein patients with Type 2 diabetes bathed themselves in a hot tub with 30 minutes per day found that after only 10 days patients required reduced doses of insulin, lost weight and benefitted from enhanced health as well as an increase in their general sense of wellbeing. The Arthritis Foundation found that people, whose arthritis symptoms responded well to heat, received many benefits from hot tub therapy including reduced joint stiffness and restored and preserved joint strength and flexibility. Mayo Clinic found that soaking in a spa simulated exercise, increasing heart rate whilst decreasing blood pressure. They found that the regular use of hot tubs gave some of the benefits of exercise with reduced heart stress. In a meta-study carried out by the National Sleep Foundation, they found that some studies suggested that soaking in a hot tub before going to sleep eased the transition into deep sleep. The Associated Professional Sleep Societies’ Journal ‘Sleep’ found that your body can be eased into a state of deep and relaxing sleep by soaking in a hot tub approximately 90 minutes before going to sleep. We delivered one of our Emperor Deluxe hot tubs to a very special family in Byfleet Surrey. Paul & Yvette Rogers are the parents to a very exceptional child, Christian who was diagnosed with cerebral palsy at the tender age of 18 months. Paul & Yvette purchased the Emperor as a recommendation to aid with Christians movement whilst commencing on a brave journey to raise £50,000 for fund a lift changing selective dorsal rhizotomy (SDR) operation which unfortunately is not funded by the NHS. With fundraising, fantastic support and incredible energy from Paul and Yvette, the target of £50,000 for the operation has been reached and Christian received this life-changing operation on December the 8th 2015. ‘We used the hot tub to prepare Christian for the operation and it will play an even more important role in his recovery.’ - Paul Rogers. on people’s lives, an area of hot tub benefits which is frequently overshadowed by the social attributes of hot tubs. Sincere thanks to Paul & Yvette with their input in helping us achieve this achievement. The award was collected by ourselves on behalf of Christian and Paul was kind to send us a picture of Christian with his award. 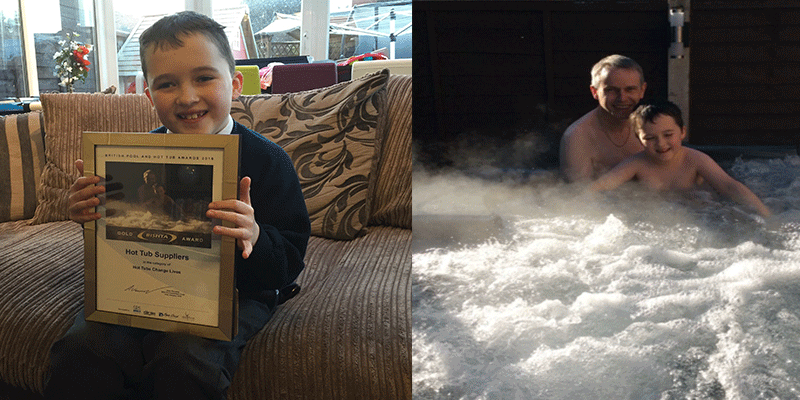 In 2017 & 2018 we also gold collected awards on behalf of 2 special people Dayton Smith & Amy Headridge and thank all families for sharing their story & showing the positive influence hot tubs have provided in their lives.